In 1904 Biase Rossi, a dairy farmer by trade, came from Italy to the United States and settled in Welby, Colorado. With help from his son, Angelo they started a small dairy farm and initially raised only a few mixed vegetables to help feed their family and several other families in the area. 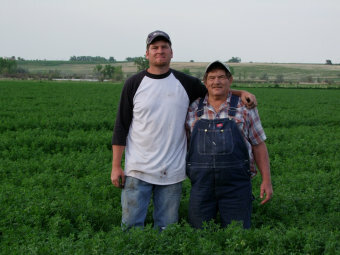 Biase and sons Angelo, Lawrence, and Frank Rossi continued to grow produce and milk cows in Welby, Colorado. Several decades later in 1980 Frank’s son Ray Rossi moved Rossi Produce to Hudson, Colorado. For the last 37 years, Rossi Produce has continued growing the very best produce that Colorado has to offer. They farm over 500 acres of summer squash, winter squash, pie pumpkins, ornamental items, and pumpkins. Also, They still raise 500 plus acres in forage for neighboring dairy farms. Food Safety and quality is our main focus. We are PrimusGFS audited and FSMA certified. Everything packed and harvested is hand picked and packaged to ensure our customers receive only the finest and freshest produce possible. The 5th generation for Rossi Produce, Vince and Lee are continuing to grow and develop the business in the Rossi tradition.